Our Methylation Sensitive Restriction Enzyme qPCR service is the most cost-effective way to validate DNA methylation data from differentially methylated regions you are interested in (discovered by MBD-seq, Infinium 450K array, etc.). One of the first technologies for the investigation of DNA methylation made use of restriction enzymes (REs). Today DNA methylation analysis typically involves the use of MSREs that cut only umethylated DNA but not methylated DNA (e.g. AciI, HpaII). 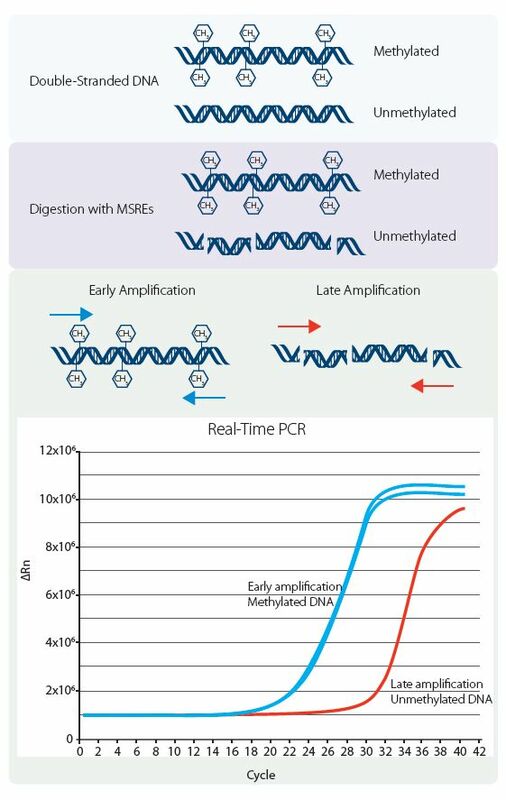 The combination with quantitative PCR (qPCR) based detection enables a reliable and simple detection of DNA methylation targeting native DNA sequences. First of all the assay design will be performed. Customers will identify around 120-150 target regions of interest which can be used for the design, so eventually either 48 reaction (or 96 reactions) can be set up including qPCR control assays. During the design phase, regions will be selected with preferably at least 3 sites of either AciI, Hin6I or HpyCH4IV [HpaII]). Secondly the design will be qualified by running a qPCR run on a dilution series of human DNA (4 concentrations; independent of methylation pattern) followed by data analysis. Also a HTqPCR performance test will be run, during which performance data (LOD and LOQ) will be defined. Then finally under optimized conditions the MSRE-qPCR run on your samples will be executed.